Chinese love to eat, and Chinese food includes a large variety of ingredients, which can be reflected well in the saying (although it is a bit exaggerated): "the Chinese eat everything with four legs, except for tables, and everything that flies, except for airplanes". 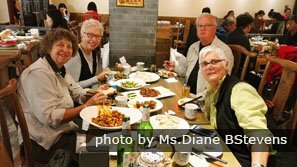 Our article explains what Chinese people eat. Some ingredients can be obtained at your local supermarket, while others can only be found at a Chinese/Asian supermarket. Rice is a major staple food in China. It is mainly grown in southern China. 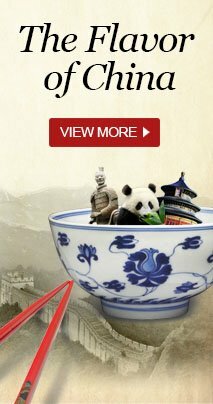 Chinese people eat rice almost every day for meals. People also use rice to produce wine and beer. 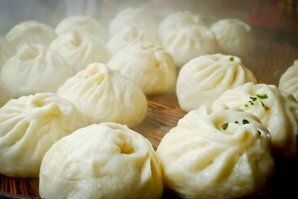 It is one of the most popular foods in China and is used in many dishes. One of the most popular dishes is Yangzhou fried rice. Learn more about rice dishes. Noodles are a basic staple food in China. Chinese people love noodles very much, especially in the north. Chinese noodles are generally made from wheat flour, rice flour, or mung bean starch. Noodles are often served in soup, or stir-fried with meat, eggs, or vegetables. 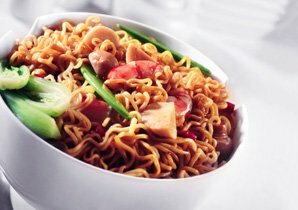 Learn more about Chinese noodles. Tofu, or bean curd, is a food of Chinese origin. It is made from soy milk, water, and a curdling agent. 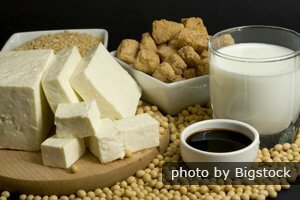 Tofu contains little fat and is high in protein, calcium, and iron. 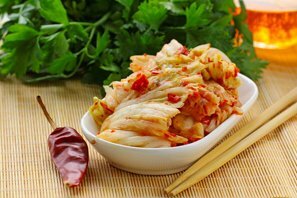 It has been a staple of Chinese and Asian cuisine since ancient times, and has recently become a popular ingredient used in Western vegetarian dishes. It is served in soups, salads, and stir-fried dishes. The most popular tofu dish is mapo tofu. 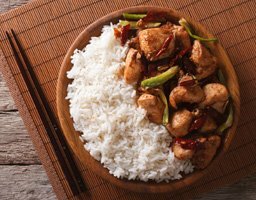 Learn more about Chinese tofu and tofu dishes. Chinese people basically eat all animals’ meat, such as pork, beef, mutton, chicken, duck, pigeon, as well as many others. Pork is the most commonly consumed meat, and it appears in almost every meal. It is so common that it can be used to mean both meat and pork. 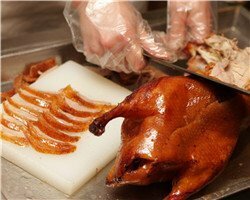 Peking duck is a famous duck dish in China. Every part of the animal can be eaten, be it meat, skin, fat, blood, or entrails. Chinese people rarely eat any raw meat. They prepare and cook meat in various ways. All meat can be boiled, stir-fried, stewed, roasted, poached, baked, or pickled. China has a large consumption of eggs each year. People consume eggs laid by many types of poultry; the most common ones are chicken, ducks, geese, pigeons, and quails. 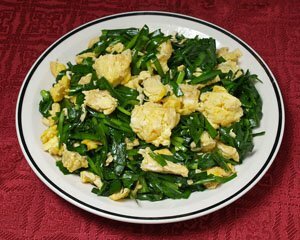 Eggs can be steamed, boiled in soup, or fried with vegetables like tomatoes, cucumber, chives, green chilies, and green onions. Food savvy Chinese people make lots of dishes with eggs. 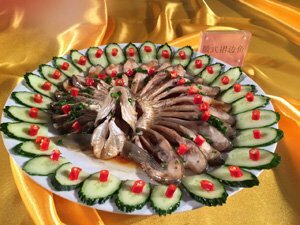 The most unique and famous ones are probably salted duck eggs and century eggs (preserved eggs) — both are produced and eaten all over China. Vegetables are, in general, the second most fundamental part of Chinese cuisine, after rice. Chinese people are fond of vegetables, especially leafy greens, and eat many different kinds at almost every meal. We sometimes preserve vegetables and eat them as snacks. Listed below are some commonly used vegetables. Leafy vegetables, including Chinese cabbage, spinach, lettuce, cauliflower, and other dark leafy greens, are very common and can be found easily in supermarkets. 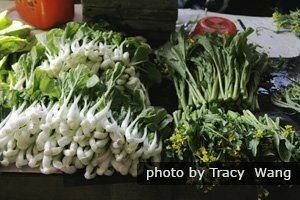 They can be stir-fried with sauce and condiments, used raw in salads, or pickled. 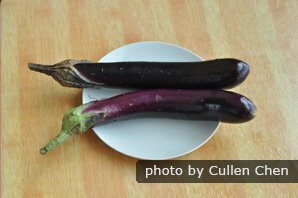 Chinese eggplants are usually long with a purple skin. They are usually stir-fried with meat or stir-fried with garlic sauce. They can also be used in a salad with condiments, or pickled. One of the most famous Chinese eggplant dishes is braised eggplant. Creamy white with a smooth skin, a raw white radish (daikon) tastes crispy and has a sweet, fresh flavor with a bit of a spicy bite. It is a good source of vitamin C. Chinese people prefer to use them in stir-fries, stewed in soup with meat, or pickled with sauce. Mushrooms used in Chinese food include wood ears, golden needle mushrooms (金针菇), shiitake (‘shii-tree mushrooms’ 香菇), oyster mushrooms (平菇), and tea tree mushrooms (茶树菇). Chinese people often use mushrooms, fresh or dried, when cooking a hotpot or making some meat soup. 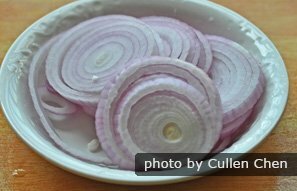 Chinese people use onion in a wide variety of dishes, especially in stir-fries. It can be stir-fried alone as a dish, or stir-fried with pork or other meat like beef or mutton. Rich in vitamins A, B, and C, soybean sprouts can be eaten raw in salads, and are also popular in stir-fried dishes. 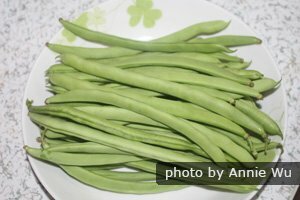 String beans are also known as green beans. They are usually stir-fried with pork, or dry fried until the skin turns brown. Carrots are a popular vegetable for Chinese people. They are widely used in many dishes, especially in the preparation of salad. Bamboo shoots that are fresh, dried, or canned are very popular as an addition to stir-fries. They are used in numerous Chinese dishes and broths. 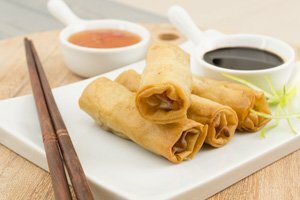 Learn more about Chinese vegetarian food. Ginger: the most common Chinese food ingredient used as a spice for seasoning. It is usually used along with garlic in stir-fried dishes, when making soup, or in a dipping sauce. 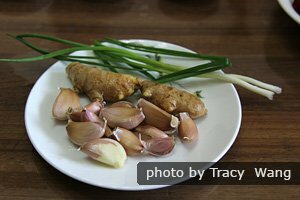 Garlic: it is often used to season cooking oil along with ginger. It is used throughout Chinese cooking. Or you can contact us and we can tailor-make it for you according to your requirements.